Dear H&M, why is your bottom sizing so rubbish? (as in the sizing of your clothing, not your actual rears). I’m not a slave to labels by any means, but it would be nice to order my size and for it to, y’know, actually fit? And not to have to order TWO sizes bigger just to be able to get the buttons to fasten. I know I’m not the skinny minnie I once was, but I’m also not a size 16. On that basis, who on earth is buying your size 8 stuff? Children? Fairies? No-one? Strange really, when a size 12 top is often big enough to house a small country, all it’s inhabitants and a group of visiting tourists. 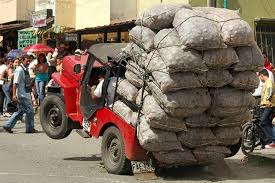 An online order triples in size (at least) due to having to select at least three sizes in everything to get the right size. Think of the poor delivery man, having to cart all that stuff upstairs to my apartment. Old England and an orange face! Today I had a meeting in Stratford upon Avon – the birthplace of William Shakespeare; steeped in culture and history. Half way there, I noticed that my face was an unfortunate shade of orange! I had used new bronzing pearls this morning and evidently they were too effective. Rather than a warm glow I had a look of an oompah loompah (with a pale neck); not ideal job candidate material. Cue frantically rubbing my face with a tissue while navigating country roads. Unfortunately I didn’t have time for a wander round Stratford. I did, however, make an unexpected stop in Wootton Wawen. My only prior knowledge of this place was going through it on a train, and laughing because I thought the pronunciation sounded a bit Jonathan Woss-esque (I’ve since found out it’s pronounced Warn, which isn’t nearly as much fun). 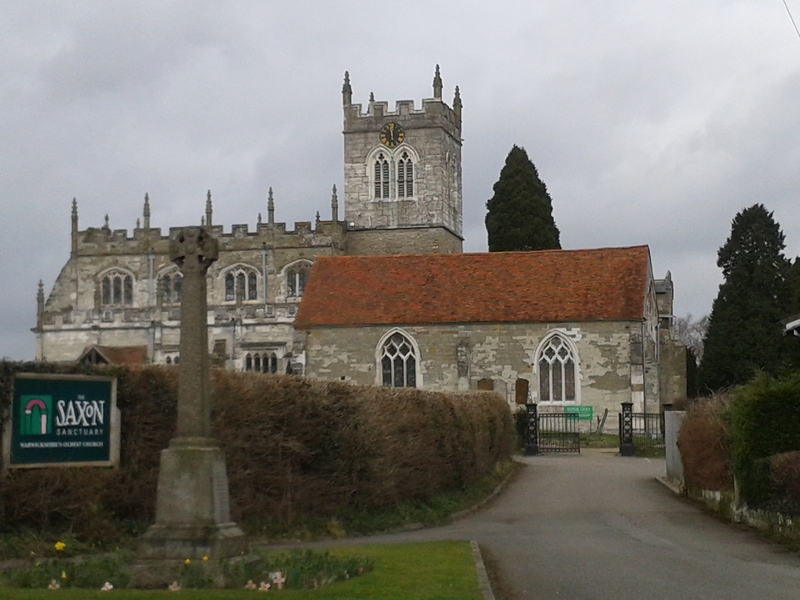 But today I drove through, and was thrilled by it’s prettiness, even on a grey day. 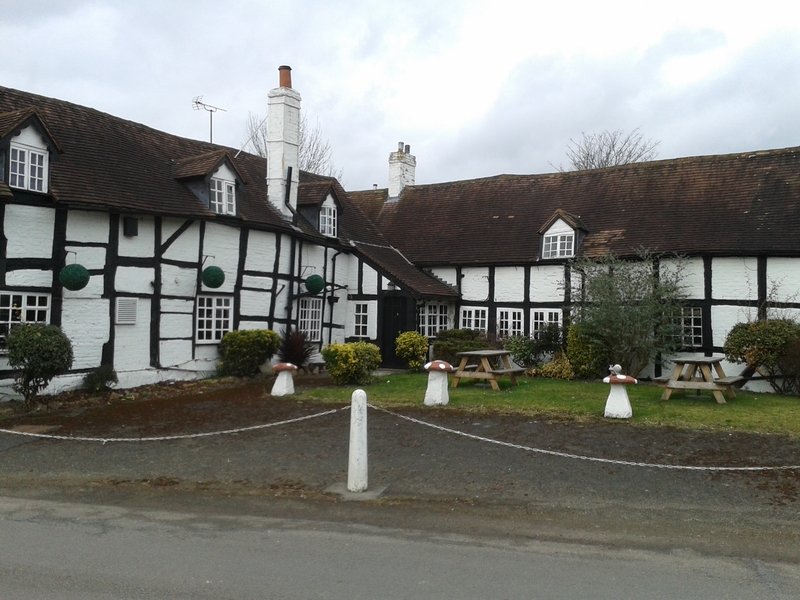 The Bulls Head pub was built in the 17th century – those are original beams and real thatched roofs. St Peter’s church is one of the oldest structures in England’s Midlands. Its tower dates back to the 900s, if not earlier. 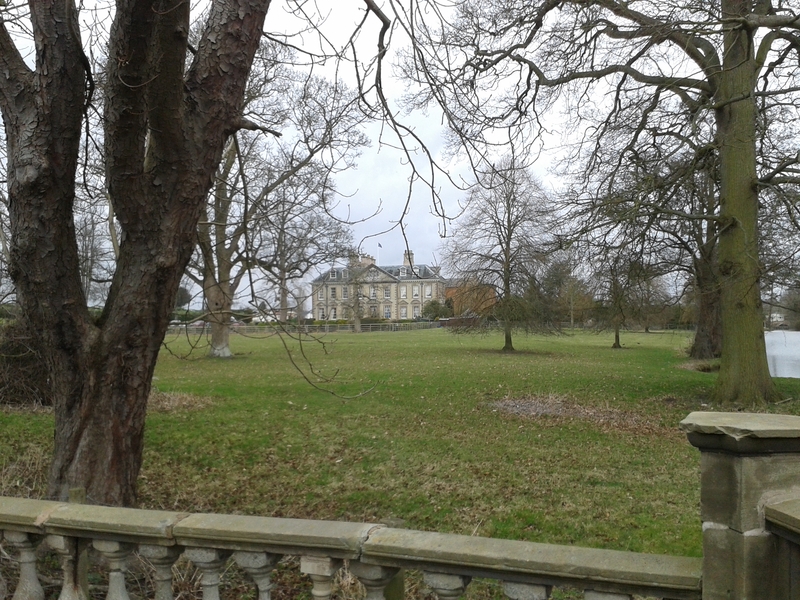 The building in the distance is Wootton Hall, and the grounds are home to a residential caravan site, aimed at “mature residents”. I couldn’t see any of the homes from the road, but what a picturesque place to live. 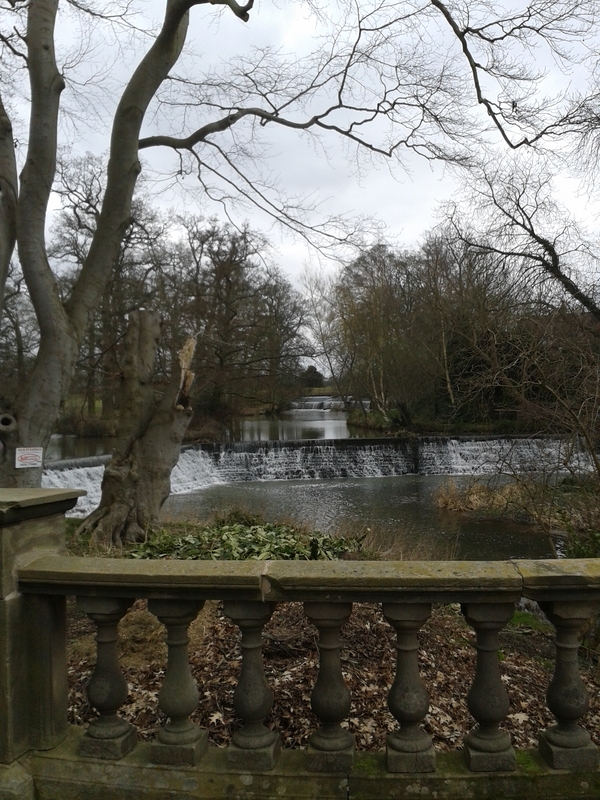 There’s also this weir waterfall, I think it’s connected to the lakes in Wootton Hall. I do love the sound of coarsing water; so powerful and nature-ish. 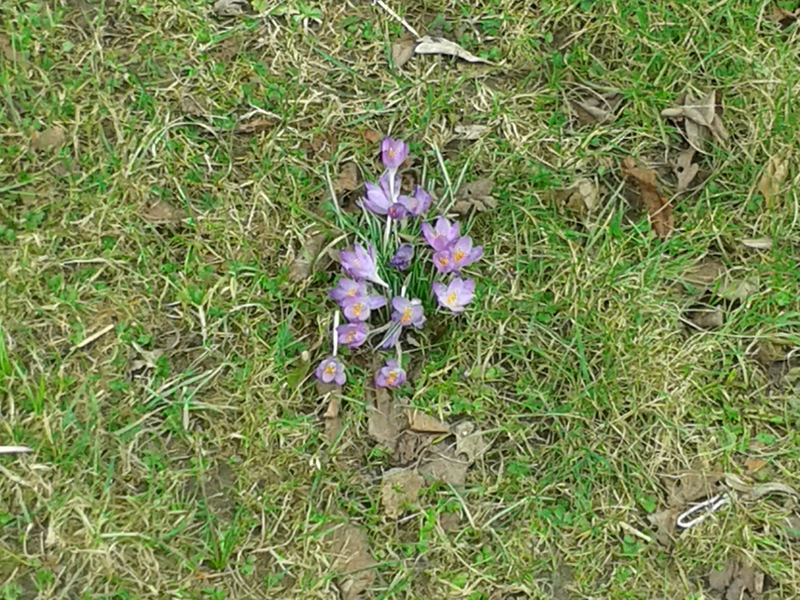 Oh,and I saw my first crocus of the year! 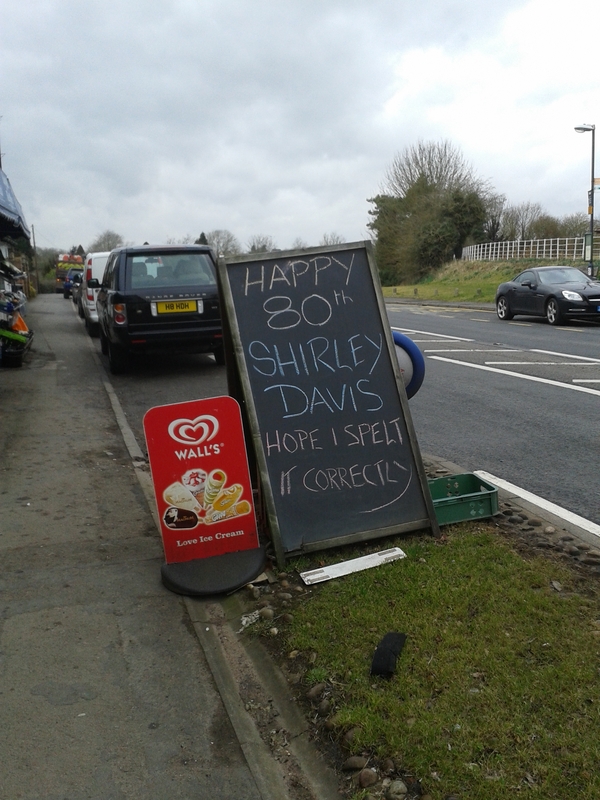 And this sweet sign outside the village shop. Wootton Wawen is probably only about 30 minutes drive from home, but couldn’t be more different. I’m going to head back in summer when the trees are in bloom, and maybe have a cheeky vino and some lunch in that wonderful pub. After a few days of letting the redundancy news sink in, I’ve started to get pro-active on the job front. So yesterday I made some calls to recruitment agencies, and today I had interviews with two of them. I’ve only had very brief experience with agencies previously, and that was 8 years ago when my skill set was very limited and people like me were two-a-penny; hopefully my career currency has improved since then. What to wear was a slight quandary, as it’s not formal but also you want to project the right image. I took my nose ring out to show I mean business! While trying to find the first office I came across a young lad with a nosebleed, who told me he’d just had his wallet stolen and was trying to get enough change for a bus. Then I realised I was in completely the wrong place (my geographic knowledge of my own city is poor at times), plus the waistband on my tights was loose so I was scuttling along trying desperately to hoist up my opaques without drawing attention to myself. All this in galeforce winds. At least it wasn’t raining; no-one needs a frizzy me on their hands asking for a job. My second interview was in another part of the city. 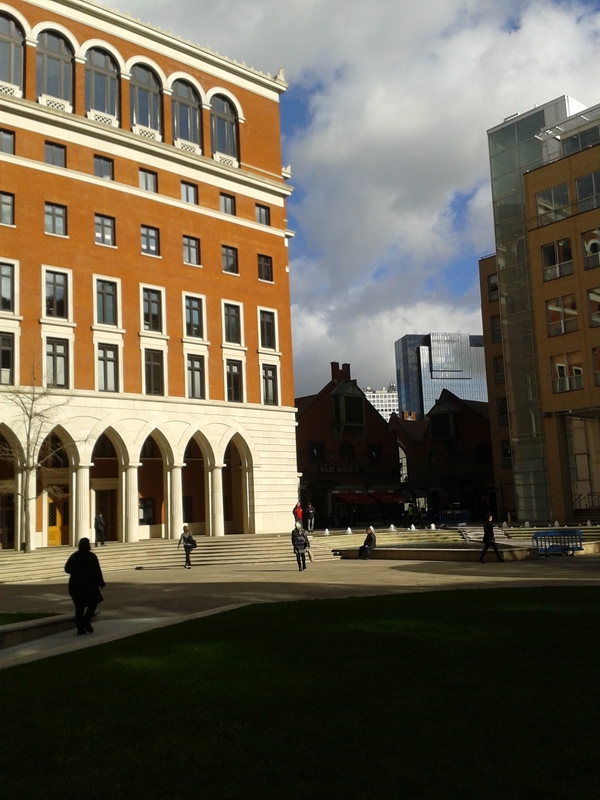 I took this photo when I came out; it was beautifully sunny, although cold. I thought I’d have a little sit down near the fountain before I left, but then the sun went in and my cape started blowing perilously close to the water (it’s a blanket wrap, I don’t think I’m a superhero). I did spot a lad walking round in a t-shirt, and a girl in sandals. Pretty daft when it’s only 7 degrees. Case in point is this dress from Tesco F&F. Because I can’t resist a sale email (I try, but get suckered in “just to have a look”) I had a root through the dregs of the Tesco F&F sale, and ordered a few bits. Most were consigned to immediate return, as was this dress on first sight, but trying it on “just out of curiosity” it became a keeper. The picture doesn’t do it justice (what a cliche) but it’s too much of a bargain and a lovely item to return. Costing the princely sum of £10 (reduced from £35), for someone who can pop into Poundland for one thing and come out £15 lighter in pocket, this is a no brainer. It’s not a length that I would usually go for, but there’s something quite unusual about it.. It’s made in panels, and the fabric has a metallic sheen which catches the light. I’m far from boobilicious, but with a good strapless bra I think there could be some decent curves going on. So, how and when will I wear it? At the moment I don’t know. I don’t have an event in mind, but it would be perfect for a wedding (full day or evening only), or a summer party. It would look lovely with metallic accessories (shoes and clutch) or I could add a thick black waist belt and very pointed black court shoes to toughen it up a little. It would also work with a black velvet short jacket for a winter event. But, I’m thinking I may wear it for something left of centre – like Download Festival with a pair of chunky boots. That would be fun! It’s always good to have things in your wardrobe that you love and look forward to wearing, and it certainly takes the pressure off trawling round the shops in a blind panic and throwing money at the situation. I’m a big fan of TripAdvisor. I always check it when booking hotels – it has a big impact on my travel plans. Of course some reviews are just ridiculous (marking a Spanish hotel down because they don’t serve chips, for example), but it’s usually a good indication of whether a place is going to meet your travel needs. Sometimes you want luxury, sometimes just a place to sleep. Things like location are usually key points I pick up on from reviews, plus breakfast quality of course! 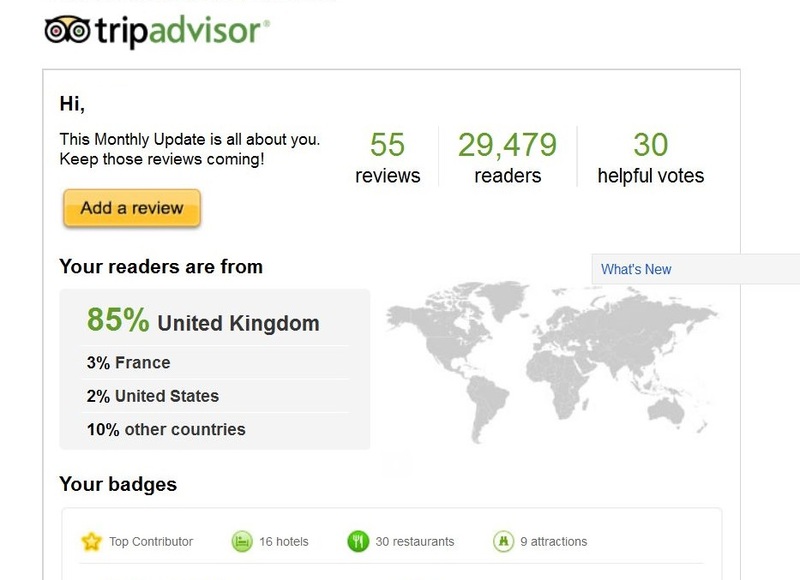 I also love the feedback you get from TripAdvisor on your own reviews! Almost 30,000 readers. Wow! Poor old Madonna. So many people seem to find her Brits tumble hilarious – why is that? Why are we so keen to ridicule people when something bad happens to them? I was in a nightclub once, with a new boyfriend* and some friends, when I perched on the edge of a table. Turns out the table top wasn’t attached to the table legs, and I went A over T, with the table top landing on top of me. The shame! Stupidly, later in the evening, I did exactly the same thing again. Alcohol may have been involved. *Said boyfriend later became husband, so no lasting harm was done, although we do still mention it from time to time! Well done to Madge for styling it out, and being the consummate professional she is. I’ve been thinking of starting a blog for a while. A meander round my thoughts and interests. But something else always took priority. And then I got made redundant. But its all OK. The world didn’t stop turning. I didn’t have a panic attack. But I did take action! Online action. 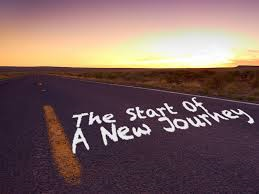 This first post is nothing to do with how things will look from here on in. But that’s the background. If nothing else, I’m going to have a lot of time on my hands!